NextGIS Formbuilder is a desktop application for creating and editing forms. 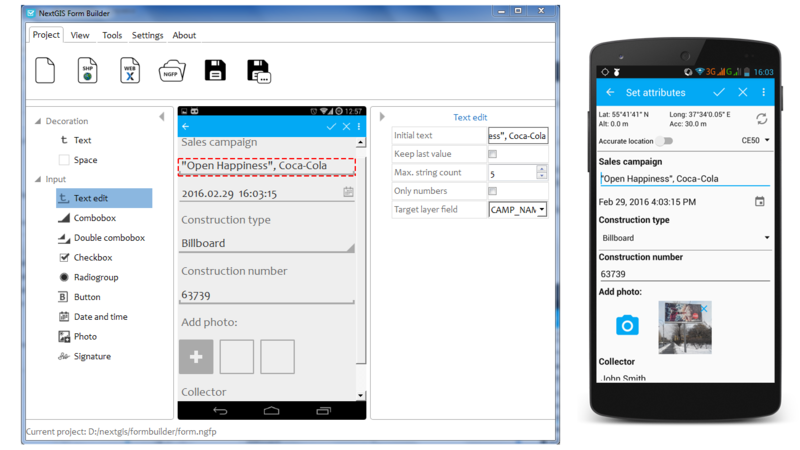 Forms can be uploaded into NextGIS Mobile to be rendered on the fly for convenient data collection. save set-up form together with data for upload to NextGIS Mobile. This software serves as a platform for our custom software development projects geared for specific requirements, so it can lack some functionality including basic stuff. I used Formbuilder to make a form for NextGIS Mobile, but I noticed the photo-element is not working on my Android devices. Isn’t the photofunction yet available for NextGIS Mobile? Turns out it was a bug. It was fixed in 2.4.1 release. I downloaded the installation file (16483 kB) several times and checked that the file privileges are set ok.
Have you encountered this before? Do you have an idea of what could cause it and how to fix it? Hi, Kari! We’ve tested the installer on Windows 10 Home and there was no such errors. Could you please provide some more information. At what time of the installation process does this message take place? At the end? Are you logged in as administrator? Also try to explicitly run the installer as administrator and/or deactivate your anti-malware software. the error appeared at the end of the process when all program files were downloaded/extracted. My installation file was on a network disk which is my standard way of doing installations. This time that did not work. But when downloading the installation file to my local disk all went fine. Why does not support the Persian-language NextGIS Formbuilder. ? When I want to add a saved list with CSV format, I add it to the combo in the form of the toolbar. Persian letters change shape.